We pick our days! The morning started out very windy and our wonderful, determined guests arrived very windswept at St. Andrew’ s. However the atmosphere was warm & welcoming inside. After refreshments, we were royally entertained by Geoff Twentyman who had us casting our minds back to the 1940s, 50s and 60’ s, in the days of steam-driven radio. This involved a lot of head-scratching about who said what. Everyone was soon transported into another era. Lunch followed. Which everyone enjoyed. After lunch, everyone was entertained with the delightful voice of Cathy Ryan. She led a delightful time of excellent songs. We finished the day with communion, to give thanks to God for this wonderful time we had had. The chauffeurs arrived and everyone was escorted back to their homes. I would like to take this opportunity to thank the most wonderful team of helpers for all that they did, in transporting guests, feeding and watering everyone, and drawing alongside others. There is one other group of people I would wish to thank and that is the marvellous group of guests we have. Thank you for coming to Holiday at Home. Well that is all. (Or is it?) Keep your diaries free for the 3, 4 and 5 July 2017 when we will reconvene at St. Andrew’s again. The trip out this year will be to Knowlsley Safari Park, near Liverpool. This took place at St Andrew’s on Wednesday 11 January. It was special for Roy and myself, because we were invited as guests instead of being helpers, which has been the case until now. It felt strange, going on our own, instead of collecting other people to take. Then we could sit down and socialise, instead of making sure our guests were comfortable and serving them tea or coffee. 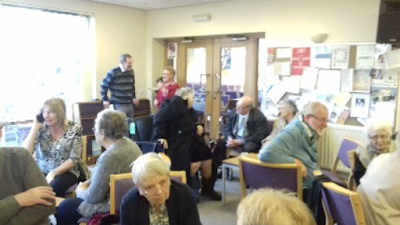 There was a pleasant time of chatter, laughter and enjoying refreshments. This was fine for me, but Roy eventually had to remove himself into church, because of his over-sensitive hearing. He and others are OK with this, as it is a regular thing on Sunday mornings after service. There followed an hour of ‘ All our Yesterdays’ entertainment, which made me realise how old I am, but which brought back happy memories of comedians, singers and characters of my younger days. It was time then to go into church for lunch. Again strange but pleasant, to be seated and served with a delicious meal, made and brought by loving hands and worthy of any pub or restaurant (minus the strong drink!). We were able to renew friendship with Denis and Eleanor from Eccleshill Day Centre (now closed) and catch up with what’ s happening to them now. We shared laughs over the crackers, jokes and plastic frog-flicking – proving that some of us never grow up! After lunch, Roy was ready for home, so Frances very kindly took him, while I stayed to listen to the singer and join in the singalongs. Again, no helping with clearing up or serving teas and coffees! The day drew to a close with a short communion service, presented and administered by Revs Phil and Nick. Everyone said their ‘ Au revoir’ s promising to meet again in July. Thanks go to John Wilson, for his careful planning, and to all the willing helpers. I would urge anyone who is eligible to give some thought to joining the guests for the next Holiday at Home, on 3 – 5 July. From two, at first reluctant, recently promoted from helpers to guests. Methodism has been in Haiti for 200 years!